Mamas, I’m starting at the basics today. I have been guilty of getting side-tracked by the oncoming players (too many choices), teeth shattering tackles (rashes and stink issues), and an over-sized defensive line (growth spurts and finding the right fit). All of those issues matter, but it’s when I lose focus of the main thing that I get overwhelmed. They’re poop-catchers for crying out loud! Yet, I’ve dreamed of the ultimate stash, buying the next hottest cloth diaper, or designing the next big hit in cloth diapering! So, breathe. It isn’t as hard as it looks. Here are the Cliff Notes for Cloth Diapers 101. * Why Cloth Diaper? Cost, Health, Environment. Yes, you can save thousands of dollars cloth diapering, even when you factor in washing. Don’t overthink it. Buy inexpensive prefolds and covers, a few snappis, and a pail. Stick to the basics and you won’t spend much. Disposables contain very harmful chemicals that allow them to absorb massive amounts of pee. Sodium Polyacrylate is super absorbent and can also cause health problems to your little one. Also, Dioxin, used to bleach the cotton, is a known possible carcinogen. Disposables= huge landfills, millions of trees destroyed, huge waste of non-renewable resources. It’s really a no-brainer that disposable diapers are bad for the environment. Flats are a square piece of material with the same absorbency across the whole diaper. Most are a single layer, some are double. Flats wash easy and dry fast (great for hand washing and hang drying). Pins are simple to use with flats but a snappi will work as well. Flats are very trim but have to be changed often. Prefolds are also a square piece of material but have a center strip of extra absorbency. You may see 4-8-4 or 2-6-2 indicators by different prefolds. This refers to the layers in each “section”. On each of the outer sides would be 4 layers and in the middle would be 8, for example. Prefolds can be fastened with pins, snappi or trifolded and laid in a cover. They also are easy to handwash and dry. Cost is very low. New, high quality prefolds can be purchased for around $2.00 each. Prefolds are very versatile in that you can also use them as pocket stuffers. Fitteds are a cloth diaper that also requires a cover but has elastic and fasteners on the diaper. Fitteds come in every material and cover imaginable. They can be fastened with snaps or aplix (velcro). The most common questioned asked by new cloth diaper parents is “why spend money on a cute fitted when it just has to be covered?” Valid question that I myself asked. It can be answered in a couple of ways: 1) we all like pretty underwear 2) you can let your little one go coverless and change them often. Fitteds are “easy” to make (easy meaning you can use materials you have in your house) and are therefore the biggest category of diaper made by WAHMs. Fitteds take longer to dry and need to be thoroughly washed and rinsed to prevent buildup. Pockets are a simple 2 layer diaper. The outer layer is waterproof and the inner is a soft material for next to baby. A pocket is left at the top of the diaper for you to put in the absorbency between the outer and inner layers. You are free to adjust the thickness depending on your baby’s needs. Prefolds cause more bulk but are absorbent, whereas microfiber is super trim. The choices for inserts is limitless. You could even use a towel or receiving blanket if your left in a pinch. Pockets can also be used as covers or swim diapers. They dry fast and for the most part wash up easy. Buildup can occur on the inner layer and “material” can get trapped inside the pocket when washing. All In Ones are the cloth diaper most similar to a disposable. Everything you need is there in the diaper- no stuffing, no cover required. All In Ones look very different across different brands. Some have the soaker sewn in, others have it partially attached outside the diaper to allow for quick-drying (you will see this referred to as QD). All In Ones can be very trim but others are quite bulky. AIO are easy to use for anyone (daycares, babysitters, dads!) but do have some washing drawbacks. They take longer to dry and can trap detergent and urine smells inside the soaker if not rinsed very well. * How do you wash cloth diapers? Ask any cloth diaper parent and they’ll give you a different answer. You will have to experiment because it does vary depending on what system you are using, what kind of water you have (hard or soft), if your little one has sensitivities, etc. I always recommend that you start of SIMPLE. Wash the diapers just like you do normal laundry. If you being to sense problems, ie. stink, rash, repelling, then start tweeking your routine. There are many more details that need to be discussed. If you have more questions (like nighttime cloth diapering, cloth diapering a newborn, or covers) check out my ebook Ultimate Guide to Cloth Diapers. 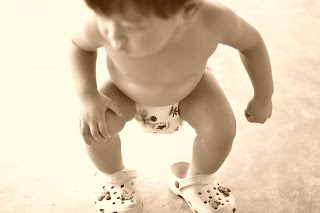 Combine that information with the posts on my blog and you’ll be a cloth diapering expert in no time.